About three thousand years ago, a hoard of swords, spears and other objects was gathered together and deliberately destroyed. These were deposited in the lake at Duddingston Loch in Edinburgh. There the objects stayed until 1778 when a dredger pulled them up from the depths. 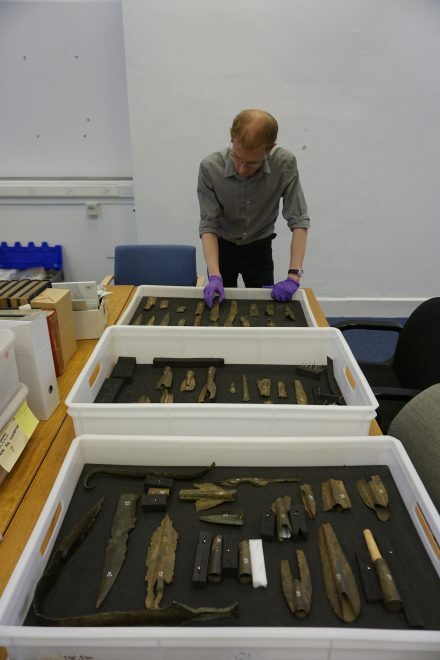 We still have 44 bronze objects in our collections though the whereabouts of some of the others are no longer known. Likewise, the “sculls and other human bones” and animals remains never made their way into our collections. In trying to answer some of these questions, I have been re-analysing this hoard. 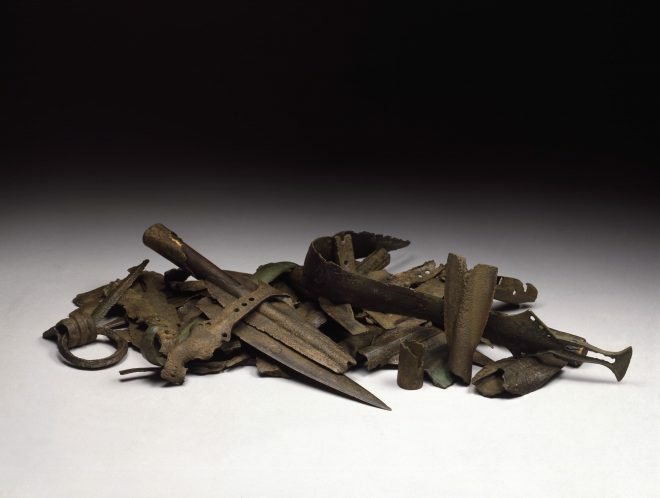 As it stands, the hoard includes about 29 damaged or broken swords and blades, 28 broken spearheads and a handle of a bronze bucket. Historically, the Duddingston Loch hoard has been interpreted as a pile of scrap metal that was abandoned in the Bronze Age, but this view is steadily changing. The large number of swords and spearheads suggests this may have been the equipment of a band of warriors. Other hoards like this have been found elsewhere in Britain, such as a similar hoard of burnt and broken weapons from Peelhill, South Lanarkshire. 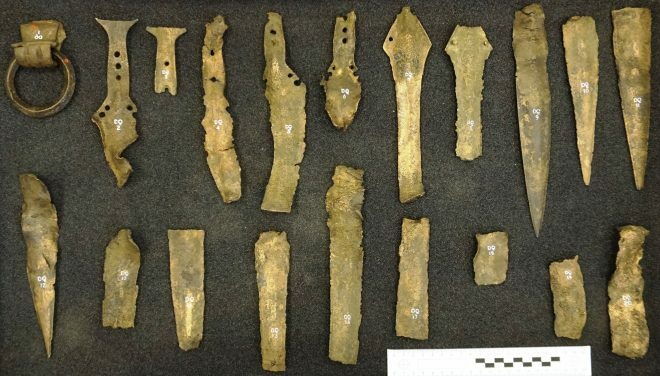 Tobias Mörtz of the Freie Universität Berlin has suggested these hoards might be considered “weapon sacrifices”. 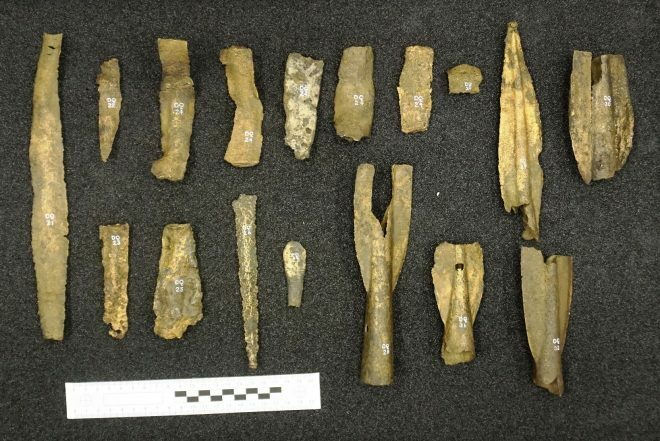 Bronze Age communities may have been deliberately sacrificing their weapons, perhaps as offerings to the gods. The Duddingston Loch hoard certainly suggests sacrifice. Most of the objects are bent, broken and burnt in some way. This can be seen on their ‘rippled’ surface caused by exposure to extreme heat, perhaps on a pyre. The bending and breaking suggests ecstatic actions requiring lots of force and the overall intention to make sure these objects could not be used again. Another explanation for this is that it could be a war booty taken from an enemy; in this scenario the objects may have been destroyed so that the enemies could not use them in the afterlife. Could the “sculls and other human remains” that were dredged at the same time be the enemies that were killed? My previous research has looked at the deliberate destruction of swords and spearheads and found that to break Bronze Age bronze objects in this way requires temperatures of around 600ºC or more. The Duddingston swords and spearheads would have been placed in a fire, left to heat, and then broken by hitting them with a blunt object. This causes the objects to snap and distort. 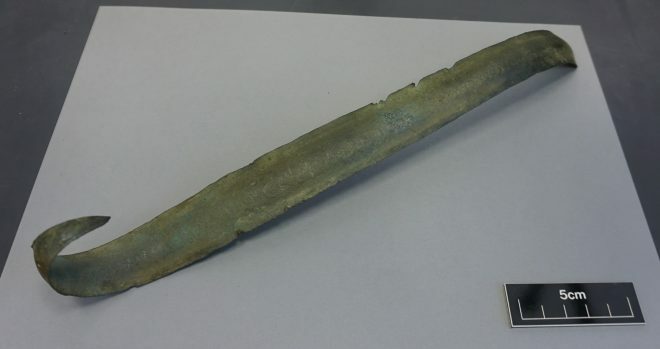 This probably didn’t require a skilled individual, but knowledge of the behaviour of bronze would have been useful and it’s likely a metalworker was involved in the process. The number of objects suggests a large fire and this may have been a ceremonial event and public spectacle with all the swords and spearheads piled up and burnt together. Whether these actions were intended as a sacrifice or to scrap the objects, it cannot be denied that depositing them in the lake was a significant abandonment of material. 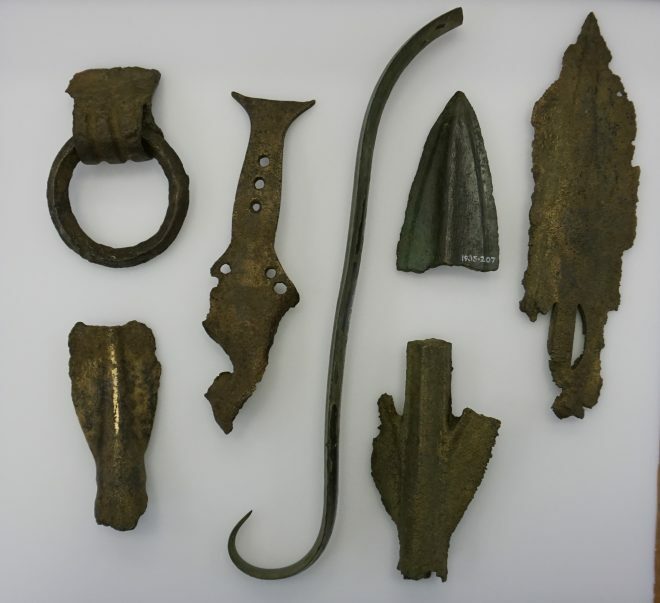 The total weight of the hoard is about seven kilograms, which is a lot of bronze that could be recycled into other objects, such as tools, jewellery, or more weapons. And we must remember that few complete objects are represented in the hoard so there are lots of pieces and fragments that we are missing. Were they kept by the people who destroyed the weapons? If so, why? Or could they still be at the bottom of Duddingston Loch? As research continues into this hoard it is hoped that we may be able to better unravel some of the answers to these questions. 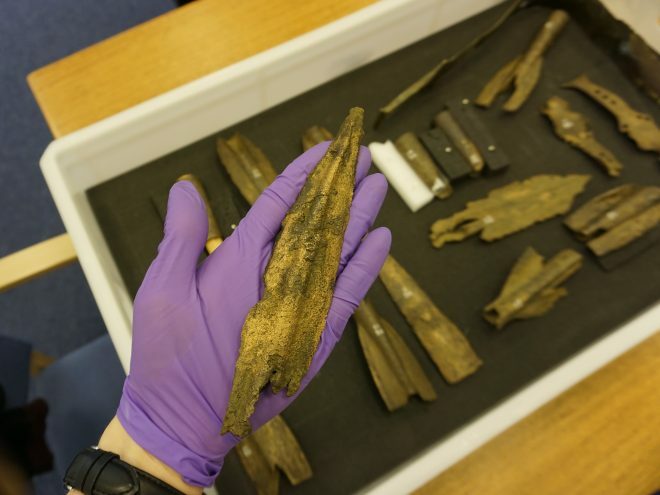 What’s fascinating is that despite its 240 year history in our collections, it remains one of our most intriguing and significant Bronze Age hoards from Scotland and will continue to encourage debate and offer insights into the actions of our three thousand-year-old ancestors. The Duddingston Loch hoard is on display in the Early People gallery at the National Museum of Scotland. Interesting that while sacrifice is always the go-to explanation, it’s not particularly useful. It’s a bit like the term ‘ritual’. The fact that they were deliberately damaged at some effort points to a desire to prevent them being used. If they were placed as a sacrifice this would make sense as it would prevent people popping back for some freebies. The damaging of weapons can also be a malicious act, done to the weapons of a defeated foe so that they may never be used again. Having the accompanying bones would probably have been useful. If they were brought up by a dredger is it highly likely that missing fragments remain.